We’ve all had a friend who just won’t stop smoking weed. Maybe we were even this way at some point. Packing another bowl after just finishing a bowl. Here’s the thing, at a certain point you’re not going to feel the benefits of smoking marijuana, and you’re basically just going to end up spending too much money on weed. Now, it’s also important to understand that people smoke weed for a variety of reasons, and everyone’s bodies also responds to marijuana differently. So these guidelines for dosage are in no way set in stone. For instance someone who wants to get pain relief may have to smoke a lot more than someone who smokes to help with social anxiety. However, overall I’ve given this advice to many over the years, and they have reported really good results. Figuring out your dosage is key first of all. Then the second factor at play is going to be the frequency with which you smoke. Amazingly you can also cut down the amount you smoke by simply moving to a smaller pipe. Dugouts are quite popular in the US, with their bats ( sometimes called one hitters ) and area a quick way to decrease dosage. 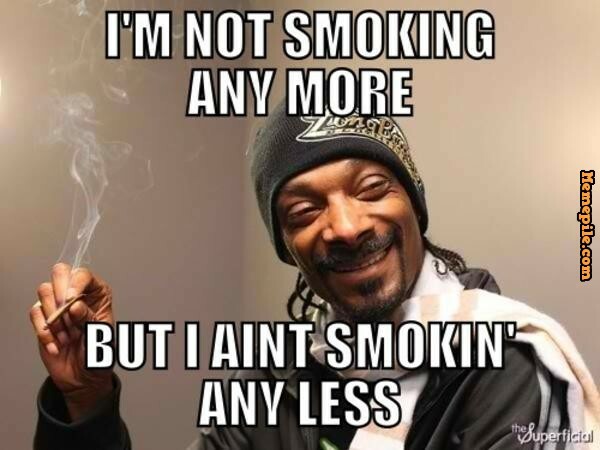 People used to smoking a bowl will cringe at just taking a few hits at a time for the first week, but as time passes, so does the amount you need. Smoke 1 hit instead of three, and continue for a week, and your tolerance will go down, and you’ll find that you’re getting the same benefits of marijuana, while smoking much less. This means that your weed will last 3 times longer! Just by switching the device with which you smoke! Other benefits I’ve noticed of cutting back the amount that you are smoking include feeling less tired later, and of course not snacking as much since cannabis obviously induces hunger. In order to use a dugout, you first need to grind up your herb as fine as possible. There are a ton of good grinders available but I would recommend using a stainless steel one since they can also be cleaned easily and stay quite sharp. Plastic grinders have a tendency to get gummy and sticky while the stainless steel ones don’t. If you want to get really fancy then it doesn’t get any better than aluminum grinders. They are a bit pricier but last much longer and many are even dishwasher safe! I’ve created a list of tips and guidelines regarding medical marijuana use that I think are good to keep in mind as it concerns dosage. 1. Do try to keep track of how often you smoke throughout the day. This can be akin to when a financial planner tells you to keep track of all your expenses for a week. And can be harder than you think. So once you’ve written down how much, and how often you smoke, then see what happens if you put yourself on a schedule similar to how prescription drugs are used. 2. Do not smoke just because you like to smoke. Smoking weed is fun, it tastes good, and it’s relaxing. As an ex cigarette smoker ( not one cigarette in four years!) I can attest to the benefits of using marijuana to quit smoking cigarettes. The problem is often that the act of smoking itself can be habit forming, and generally it’s unneeded. 3. If you are a chronic smoker, and using marijuana contantly all day I’d suggest going on a tolerance break for three weeks ( I know. I know. If 3 weeks isn’t possible then do what you can) . After a small tolerance break you can restart with a new dosage. If you had a morning bowl, switch to a morning one hit. Let the benefits sink in and don’t rush things! There’s no use in binge smoking like a spring breaker drinking alcohol. Enjoy your weed like you do wine. Don’t gulp it down! Take a few sips ( hits) and relax! 4. Stop with the giant bong hits. Bongs are fun. Absolutely, but using a bong as your sole device is going to cause you to use a much higher amount of weed, and you’re going to lose the benefits of smoking after a few months. Seriously, switch to something smaller. If dugouts aren’t your thing, then use a small glass pipe, or get one of those awesome pocket vaporizers. Remember, less is more! 5. Do plan what you are going to do before you smoke! There’s the myth of the “Lazy stoner” which I’ve adressed previously on this blog, but I do think there’s a bit of truth to the fact that people who already don’t have a lot of goals can fall into a cycle of smoking too much and sitting on the couch. So figure out what you are going to do before you smoke. Going to a dinner party? good! About to meet some friends for frisbee golf! cool. Take a class online ( Here’s a free full course online of how to learn how to oil paint!) Whatever you’re passionate about can include weed. No problem. What you don’t want to do is think to yourself “Hmmm, I’m not sure what to do today, maybe if I smoke some weed I’ll figure it out!”. Nope, you’re not going to figure it out, you’re going to end up on the couch watching Rick and Morty. Make plans first, smoke weed later.